I opted to go with the veggie plan. My little guy is a self imposed vegetarian, so I knew anything with meat wasn't going to pass muster with him, but I could always add a protein source if anyone else wanted one. I actually opted for that route with one of the meals to stretch the meal a little further so I had lunch for the next day. Two blocks of ice, a frozen food bubble bag (to help keep things cool), a reusable recipe book, and three meal kits from the veggie plan: Protein-Packed Rice Bowl, Pesto Flatbread (aka Posh Pizza), and Jamie's Easy-peasy Tomato Tagliatelle with Asparagus, Fresh Basil & Parmesan. Each meal comes in its own separate box so there is no confusion about which ingredients are used in a particular recipe. If you happen to be allergic to (or don't particularly enjoy) one of the ingredients in a recipe it's easy to remove it and substitute something else. Any trouble with this recipe? Yes. The recipe called for sesame seeds, but they were missing from my box. Picky kid approved? Yes. He ate my entire serving plus part of the leftovers. Would I make this again? No. This is a bland, but serviceable meal. It's real downfall is that it's exactly how I made fried rice when I was in college and couldn't afford to order takeout. Picky kid approved? Yes, in fact he ate most of my share too. Would I make this again? Absolutely, this was my favorite meal in the box. Quality of ingredients: Good. The basil arrived slightly discolored, which is likely because it was shipped on ice and got too cold (basil is very temperature sensitive.) It didn't affect the final dish at all. Any trouble with this recipe? No, but I felt like it needed more salt. Picky kid approved? Mostly. He picked out the larger asparagus pieces and ate the smaller ones. To be fair, that may have been because his two front teeth were loose. Would I make this again? Yes, this is a quick and easy meal I can make from items I generally have on hand. I had a little bit of produce leftover from two of the meals (half a zucchini and half a can of corn) which I used as side dishes later in the week. Hello Fresh makes cancellation easy, although it is a multi-step process with a survey at the end. The nice thing is that you also have the option to have a box delivered bi-weekly, monthly, or even pause your subscription (in case you're heading out on vacation.) Otherwise you click on No Thanks and either cancel right away or schedule one last delivery. After I cancelled my subscription I did not receive another delivery, although I do still get emails from Hello Fresh. You'll need to unsubscribe from those separately if you no longer want to hear about the service. Meal services such as this really have a lot going for them and I see why they appeal to such a large number of people. You really can't beat the convenience of having everything you need delivered to your door, requiring minimal work on your part to ensure you have a tasty and healthy meal on the table in under 45 minutes. If you're always pressed for time and struggle to get a healthy meal on the table every night, then a service like this can be a blessing. It's also great if you find yourself stuck in a rut, always fixing the same handful of things. You'll have three new meals to try out and if you like them you still have the recipe cards so you can make them again. The problem is, you really pay a premium for the convenience. Three meals at full price would have set me back $59 (and considerably more for the other plans.) To put that in perspective, I spend slightly more than that a week to feed our family 3 meals a day plus snacks (my budget for the entire month is around $400.) The price isn't something I could afford on a regular basis, but that doesn't mean I wouldn't use the service again. There are a number of instances where I could see myself ordering again, not just for myself, but for someone else. This would make a great gift for a recent graduate, young professional, or busy mom (especially one who's recently had a baby.) I'd even consider subscribing again if I went on vacation and had a kitchen to cook in so I wouldn't have to spend part of my vacation obsessing over what to feed everyone. Have you tried Hello Fresh or another meal service? Let us know your thoughts in the comments below. The holidays are always a hectic time for us since we live so far from home. It’s a six hour drive (or longer if we’ve had a recent snowfall) so I like to pack a treat to eat on the road. Monday I spent the morning alternating my time between baking and rounding up every last thing we think we need for the trip back to St. Louis. Somehow we always pack twice as much as we actually need, but once the car was loaded up we hopped in and made our way home. Even though I’m not in charge of cooking a single thing for the holiday meal this year I still hate to come empty handed. The pumpkin pie spiced pepitas I made for our trip are perfect to bring along to all of our family gatherings. 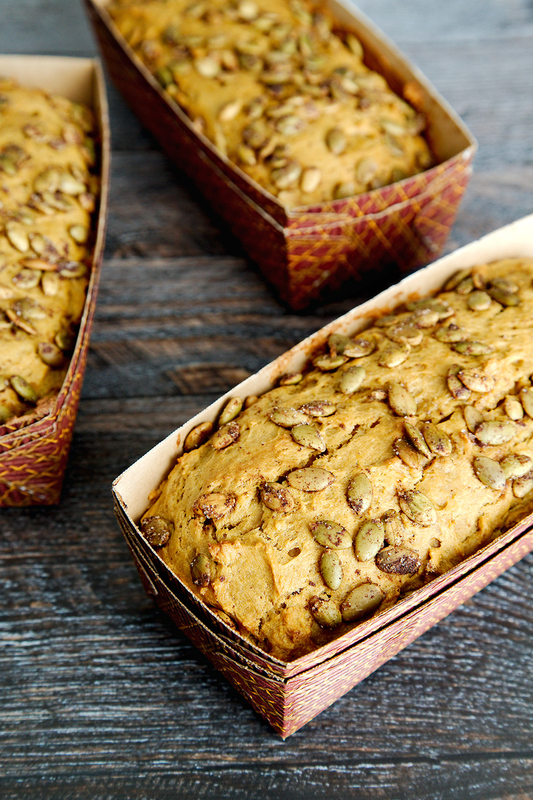 They only take a few minutes to make, especially if you buy pre-hulled pumpkin seeds (look for them in the health-food section, the baking aisle, or with the snack nuts) and you can make them in advance if need be. Toss the seeds with liberal amounts of butter, salt, sugar, and pumpkin pie spice—bake for a few minutes—and you'll have a tasty treat to share with your friends and family. They'll be gone in minutes, so make sure to bring extras! Preheat oven to 350°F. In a large bowl combine melted butter, pepitas, sugar, and pumpkin pie spice. Spread evenly on a parchment-lined baking sheet and bake for 7 minutes, stir once, and bake for an additional 8 minutes. Once the pepitas have been removed from the oven allow them to cool for 30 minutes and top with sea salt before serving. Leftover pepitas can be stored in an airtight container. They'll stay fresh for at least 5 days, but ours are usually long gone before then. Because it's summer I've decided to step out of the kitchen for long periods of time and enjoy the warm weather. You've probably noticed my posting has become a little sporadic because of it, but I do have a new recipe for you today. It's quickly become my favorite way to serve asparagus since it produces perfectly cooked spears with the minimal amount of effort. That means I can kick back with my feet up, soak up some summer sun, and read a salacious romance novel without feeling the slightest tinge of guilt about my lackadaisical lifestyle. If you're not an asparagus fan, but still want something green and tasty in your life you'll want to try our recipe for Parmesan Garlic Green Beans. Your mouth will thank you, trust me! Rinse spears under cool water before removing the tough portion of the stalks. If you aren't sure how much to trim your asparagus, take the stalk, hold it towards the end and bend. It should easily snap off the dry, woody end. Place on a foil lined baking sheet, drizzle with olive oil, add minced garlic, then toss the spears until they're well coated. Sprinkle with fresh parmesan, add salt to taste, and bake for 10 - 12 minutes, or longer for thicker stalks. Thick or thin, which asparagus should you use? For this recipe I prefer thicker stalks. The thin, early spring varieties tend to over cook quickly in the oven. You can still use think stalks, but you'll want to reduce the baking time and watch the oven carefully. Nobody likes mushy, overcooked asparagus! If you can't find lemon infused olive oil you can purchase it online (we love the Lucero Lemon Extra Virgin Olive Oil our friends gave us a few weeks ago.) Otherwise, drizzle extra virgin olive oil over your stalks and once the asparagus is done baking squeeze a wedge of lemon over the top.